Ah, our mutual monochrome friends, it's lovely to see you again. The small café, the park across the way, we'll be seeing you in all the old familiar places. Let's talk about the noise. A bone-crackingly chill afternoon in the Trentside Golden Triangle of Sport (©Wilkinson & Lund Estate Agents to the Mock-Tudored stars in local bars) with a straight 1,500 traveling Townites shuffling through the hazy maze of the Jimmy Squirrel Stand. Town lined up in electric blue in the old familiar 4-4-2 formation as follows: McKeown, Mills, Clarke, Collins, Davies, DJ Jinky, Summerfield, Rose, Dembele, Jones and Matt. The substitutes were Killip, Dixon, K Osborne, Berrett, Woolford, Vernon and Hooper. It's another same-again-Saturday for Slade's secret shapeshifting shufflers and scufflers. The Men of Pie wore their washed-out, tatty version of Town's kit with a strike force as ancient as the hills and only slightly younger than Collins and Clarke. They think they look pretty good together. Yeah, slapdash Stead and the animatronic Ameobi are that old. At least Town's back four hundred year olds won't be out-paced in the walking race. There's no substitute for experience? That's what the substitutes are for. Let's get on with it, there's a car park ticket ticking down somewhere in West Bridgford. County kicked off from left to right from the Town fans' perspective, towards the old away end, but not the old-old away end. It's all a question of perspective, isn't it? Is that chips or mash with your pie? Both? How inelegant, how greedy. County smashed forwards, Town chipped forwards and both sets of forwards were smothered by Christmas jumpers. Don't say you weren't forewarned about the forward momentum. Mills got in the way of a woefully poor Pieman pass. A thing almost happened. Aha, Town with triangular chocolates. Crosses, corners, and that ancient lost art of passing the ball to each other on the ground and moving your legs a bit. Simple things, simply done. A corner grazed away from Collins' lurking forehead, a chuck unhurled and Davies rolled to the rolling Matt. The ball bumbled off the Jam-man and Summerfield's silky shins tackled a cheeky chip towards the top right corner. Fitzsimmons fell back to flip over. Town, unlucky to not score flukely. Mills again, handily ambling into the right place to avert arbitrary almostness. Chip and chase, chip and pin, and pin the tail on the donkey. Which one? There's so many to choose from. Have we stumbled into an episode of Antiques Roadshow? Notts County? Not a problem. DJ jinked, Collins almost winked, a corner flabber-dabbered through and over and around, hitting legs and things, pinballing into the keeper's hands via parts of Matt. Has Jamie Mac touched the ball yet? 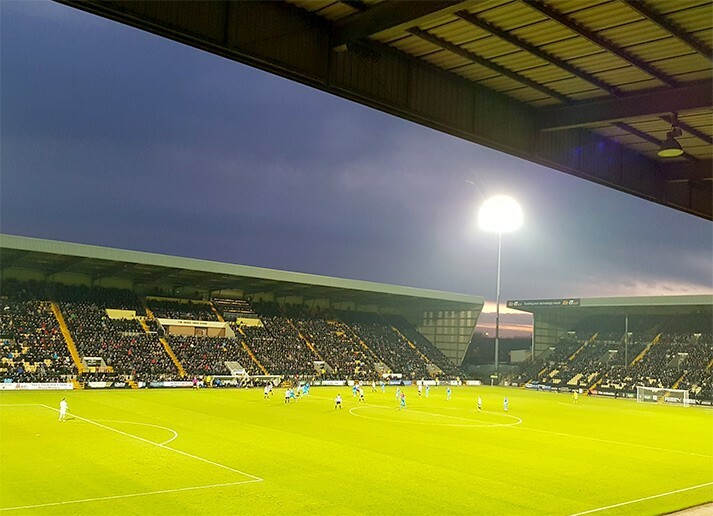 I'm glad you asked, otherwise you may believe, in error, that these Meadow Lane mumblers had a shot. Sir, that was no shot, that was a Mitch Rose back-pass, lofted with a sand wedge from the middle of the fairway and into the middle of the green. A Town chuck in, deep in the Town half, hooked on by Jones, and we're hooked on a feeling for DJ Jinky. It was full steam ahead, destination unknown, everybody cheering and no Pieman steering. DJ was dancing through their captain and we all had fun as four worker bees smelled the honeypot as his hips swayed on. A little lick to Matt, a little bit of wiggling and jiggling, and a whole lotta loving going his way if only Fitzsimmons hadn't kicked against the weight of history and kicked the ball away. This is no time for soundbites, but Countymen felt the hand of history on their shoulder with a constant craving for falling and bawling. So that's their tactic. Their singular tactic. Get a free kick five yards in from the touchline inside the opposition half, coil the free kick into middle of the area and all jump at the keeper. Then see what happens. And nothing kept happening the same way. Fall, fling, bawl. Boo-hoo. Don't tug back with rancour, he heard the ref say. And Jones did keeping chugging and tugging and was eventually booked for persistent pringle-flinging. Are they hanging up the ball across Town's wall? Are we hoping that the Imps will start to fall? So here it is Merry Halftime everybody. We're having fun, in our own way. How the heck are they joint top? Oh, what's goin' on? Ah, that's what's goin' on. It's keepin' track of the fact watching them passing back that makes the world go 'round. Countymen ran around a bit more, that's all. They're still felling and yelling, mismanaging the ref with their moaning and groaning at the slightest nudge. Ups were undered, chips were fried and they chased and chased and chased their own tails with no particular place to go. In the meantime, right on, brother. What's that sound? Each time they try you hear a loud collective sigh from Ladies and Gentleman of the Pie. They're making sludgeball to watch dry paint dry. Clarke flung his long short throws loopily, repetitively upon the home heads in a long loop of repetitiveness, repeatedly. And again, once more. What again, so soon. Yes, flung and hung and bundled back, Clarke caressed a corking cross to the near post, Matt stooped and guided lowly wide. Don't get excited, he's not short, but he was offside. Do get excited, because Dembele is short. Twisting his melon marker inside-outside, nowhere to go and crimbling a wayward waft into the home stands, highly, widely, wubbishly. Here they go again, crying in the chapel at any old challenge, plunging lower than their necklines as Rose collided with their egos. 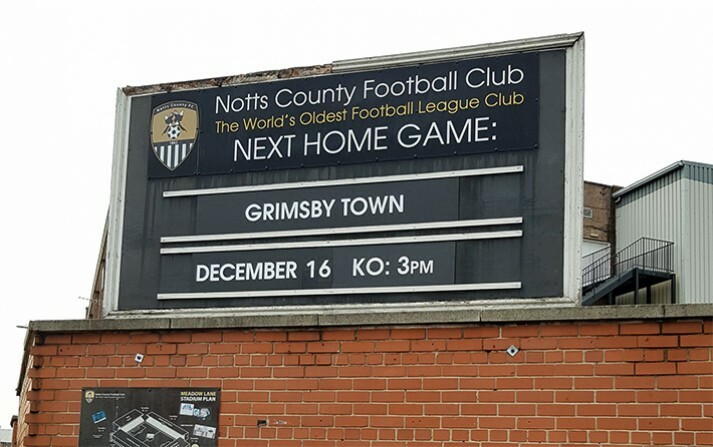 Nagging and nicking, forever kicking, County kept playing squash against Town's brick wall. A cross, a corner, a fling, a flan and Rose invaded some personal space down by the corner flag and the free kick was coiled into the near post. A striped head met ball and Jamie Mack's fists for a sore head and a goal kick. Wasn't worth it, was it laddie. How can you have any pudding if you don't eat your meat? You, yes you. You behind the bike sheds, stand still laddie. A break and a flake as DJ Jinky sneaked behind the left-back deep inside the County area. A turn inside and the blueman was leveraged aside. The ball was welly-welly-wellied away and into touch off blue. Chuckled quickly, Stead turned and burned Clarke, prancing off into the distance down the touchline. McKeown hared out, slithered across the turfage and legged up the Leggy Mountbatten of the lower leagues as the ball carried onwards and out of play. One day Stead will be gone you know, tragically taking a teaching job in Australia. The Countyites were shocked and stunned by the news that McKeown was only booked. Jamie Mack punched the free kick away which, for them, counts as a chance. A chance perchance for them to dream of something actually happening at all. And then Vernon replaced Matt. Oh yes, we replaced a lack of pace with a lacker of pace. Woah, here we go again. Some anonymous ambler on some enchanted evening carooned lowly across the face of goal through a thicket of multi-coloured boots and safely wide. Relax, relax, relax, these Piemen have no gravy in their boat. When there's something strange in the neighbourhood, who's Russ gonna call? Martin Woolford. Off trotted DJ, escorted by the referee and on came the Old Man of the Sea. Don't mock this turtle, for Woolford immediately grazed away a corner and marvellously overhead heel-flipped down and down and down the touchline, petering out through old age, but satisfyingly far, far away from the Town half. Them. Substituting Stead for another guy, who was less tall, but his pace was high. Forte, whose forte is not shooting straight. Nice. A bit of this and that and Rose was nudgled as he swooped towards bumblage near the penalty spot. Off they ran and Forte flabbled a fudge yards wide. You only need to know of one more moment in space and time. Allassandra wriggled and lollipopped, Ameobi arose in the middle, eight yards out and marvellously thumpled a header six yards wide. Marvellous. Hooper puppy-dogged on for Dembele and four minutes were added. Just enough time for them to cry baby a couple of times and Clarke to haul one more long-short chucker onto the heads of passing magpies. Have you noticed something? McKeown never made a save. It was rather too easy to stop these awfully average Allerdycian wannabees. You can see why County are marooned in mid-table, not very busy going nowhere. Oh, sorry, I forgot… facts. Appearances can't be that deceiving, can they? The table must be fake noos. A typical mid-table, mid-season mumblefest of meanderings and muddles from the mediocre and mundane. What a division, eh.